Lafayette 148 New York "City" pants with pintucked front and back detail. Approx. measurements: 8" front rise, 28" inseam, 36" outseam, 13" leg opening. Akris "Melissa" techno stretch-cotton pants. Approx. measurements: 30" inseam; 39" outseam. Rise sits below the natural waist. 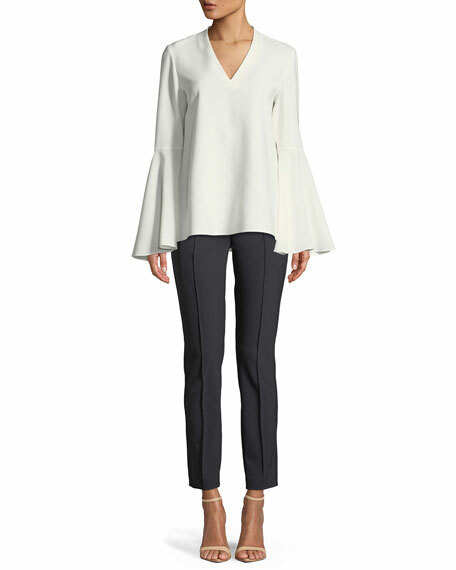 Slim-fit legs; cropped at the ankle. Center seam at front and back. Hidden side zip. Cotton/nylon/spandex. Dry clean. Imported of Italian material. Fit note: Model is 5'10"/177cm and wears size US 2/S. 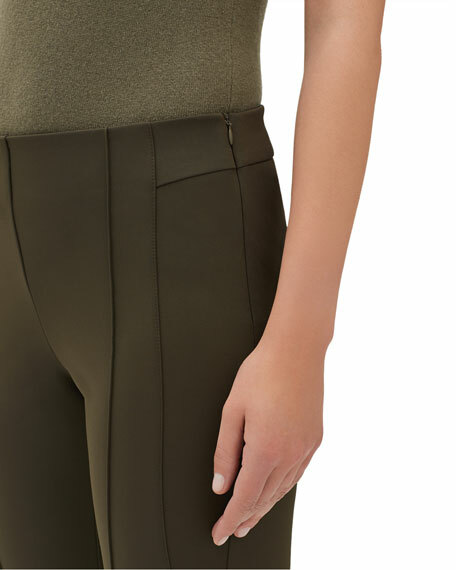 Eileen Fisher soft twill pants. Elasticized waist. Front patch pockets; back welt pocket. Straight legs taper at hem. Cropped above ankle. Button/zip front. Organic cotton. Machine wash. Imported. Model's measurements: Height 5'10"/177cm, bust 33"/84cm, waist 25.6"/65.2cm, hips 35.8"/91cm, dress size US 2-4/FR 34-36. Eileen Fisher lantern-shaped pants. Self-belt ties at mid-waist. Slash pockets; clean back. Wide legs taper at ankle. Ankle length. Tencel® lyocell/linen. Machine wash. Imported. Model's measurements: Height 5'10"/177cm, bust 33"/84cm, waist 25.6"/65.2cm, hips 35.8"/91cm, dress size US 2-4/FR 34-36.